2. Put the soy sauce, sugar, and 2 Tbsp water into a saucepan. Bring the mixture to a boil, then simmer for about 10 minutes, stirring all the time, until the sauce is thick and syrupy. 3. Remove the pan from the heat and put a lid on it to keep the sauce warm. 4. Heat the oil in a frying pan and add the sliced mushrooms and bean sprouts. Fry them for 5 minutes, then put them into an oven-proof dish. 5. Turn the oven on to its lowest setting and put the vegetables into the oven to keep them warm. 6. Put the salmon steaks into the frying pan. Cook them for about 5 minutes on each side, until they are slightly brown and cooked through. 7. 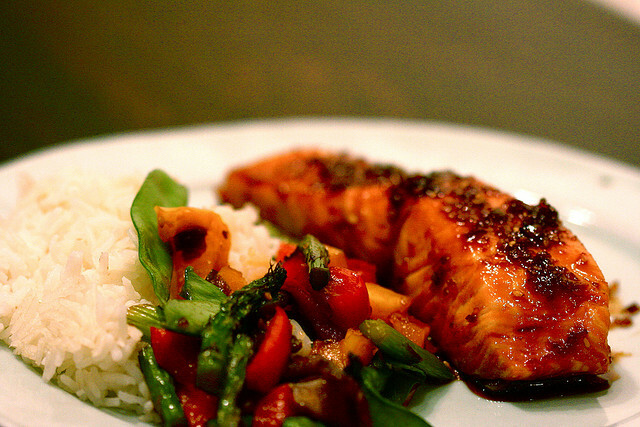 Put one salmon steak and some of the cooked vegetables onto each plate. Carefully spoon the sauce over the salmon.